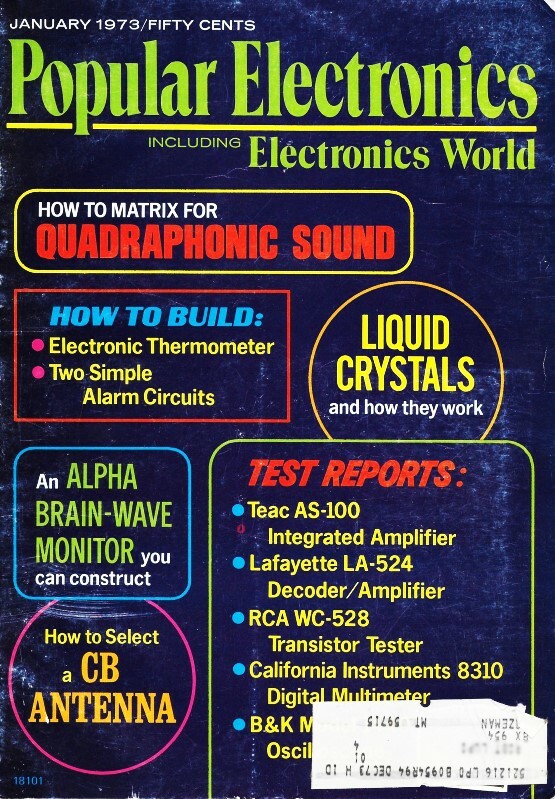 This 1973 Popular Electronics article has got to be the most concise and interesting summary of Alessandro Volta's path to the discovery of battery cells. Author David Heiserman covers not just the technical aspects of Volta's experiments, but the personal and political tip-toeing he needed to endure with contemporary physicist Luigi Galvani and conqueror Napoleon Bonaparte, respectively. Alas, that has been the case throughout history. Although such unnecessary struggles continue to impede scientific advancement, at least the unfettered access to the Internet has provided a venue for otherwise undiscoverable work to be aired. When Alessandro Volta, Italian physicist and protégé of Napoleon Bonaparte, announced the invention of his "electric pile" in 1800, he touched off an explosion of scientific discoveries and technological innovations that have shaped the world we know today. Volta's pile, forerunner of modern primary-cell batteries, was a revolutionary device because it was the very first source of continuously flowing electrical energy. Just prior to Volta's announcement, scientists were preoccupied with the problems of understanding and applying the only kinds of electricity known at the time - static electricity and the mysterious "animal electricity" discovered by Luigi Galvani. Volta's pile changed the course of electrical research, leaving the brief sparks of static electricity behind as a specialized branch of physics and making Galvani's discoveries into nothing more than a scientific curiosity. As a professor of physics at the Italian universities at Como and Pavia, Volta spent the first thirty years of his career looking for ways to generate, measure, and control static electricity. His electrophorus and condensing electroscope both evolved directly from this line of work. When Galvani sent him a copy of a paper describing a new kind of "animal electricity," Volta immediately dropped his work, and began reproducing the famous frog-muscle experiments. His primary objective was to help Galvani explain his strange observations. Galvani, an Italian physician in Bologna, had accidently discovered that touching the nerves in a frog's leg with a pair of unlike metals made the muscles convulse. He thought that the living tissues, and not the metals, were the source of electrical energy. Galvani called this form of electricity "animal electricity" to distinguish it from static electricity, and he sincerely believed he had uncovered the secret force of life. According to Galvani, the nerve tissue generated the electrical energy that made the frog's leg convulse. In the light of modern electrophysiology, he wasn't far from wrong. 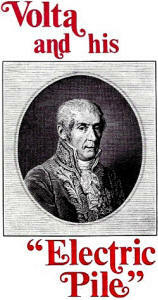 Where Galvani went off track was with his belief that the metals merely completed the circuit between nerve and muscle. As a methodical experimenter, Volta tried the experiment using two pieces of the same metal - something that never occurred to Galvani. The frog's leg did not twitch. The discrepancy came as a big surprise to both men. Volta responded by re-evaluating Galvani's theory. Galvani and his followers responded by criticizing Volta's new-fangled experimental procedures. Lower part of Voltaic pile. Most had 30 sets of metal and cardboard discs. At the time, it took a great deal of bold and creative insight to propose that the metals, and not the animal tissues, were behind this new kind of electrical energy. When Volta arrived at this notion, he began a series of experiments to show that a pair of unlike metals can produce electricity without the help of any kind of animal tissues. His first experiments used a single pair of metals bathed in either a brine solution or a dilute acid. Volta, by the way, was never able to explain the function of the brine or acid. When Galvani heard about Volta's new experiments, he responded by pointing out the fact that an electric eel can produce large amounts of "animal electricity" without the help of any kind of metal. For the time being, this argument stumped Volta; but it didn't stop him. The only research instruments at the time were those designed for studying static electricity - hardly the kinds of instruments a modern-day technician would use to study the nature of batteries. Thus, Volta had to juggle electroscopes, charged glass rods and slabs of resin to measure his "metallic contact electricity." Volta determined the relative intensity of his electrical forces by charging an electroscope with his brine-bathed metals. The farther the leaves separated, the larger the electrical tension. He determined the polarity of his potentials by first charging an electroscope with a static charge of known polarity, then touching it with one of the metallic electrodes. If the leaves fell together, the electrode had a charge opposite that of the reference static charge. If the leaves separated even farther, the polarity had to be the same as the reference static charge. His first experiments showed that different combinations of electrode metals produced different polarities and amounts of electrical tension. 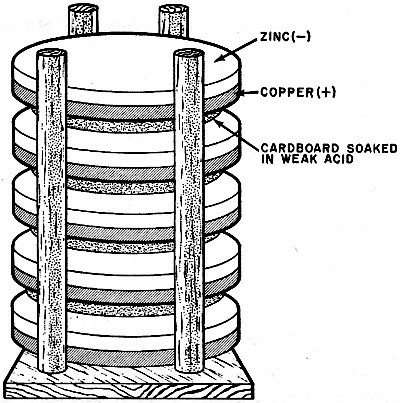 By mating all possible pairs of electrodes made from lead, zinc, copper, graphite, silver and gold, Volta constructed the first table of electromotive elements. He and other investigators later used this table to predict the voltages and polarities a certain combination of metals would produce. While Galvani was quietly gathering supporting data for his findings, Volta had to work between bouts of accusations and "public insults" concerning his allegiance to Italy. When Napoleon and his armies stormed into northern Italy, making Volta's state of Lombardy part of the French Empire, Volta was one of the Italians sent to greet the noted conqueror. Being a resident of the little state, Volta wasn't overly enthusiastic about his mission; but having met Napoleon in Paris several years before, Volta decided it would be wise to move with the tide of the times, and make the best of the political situations around him. Volta wasn't a traitor in the usual sense because the people of Lombardy had always been sympathetic to the French cause. They looked upon Napoleon as one who could finally unify the separate states of their nation. Nevertheless, a few influential Italians living in other parts of the country began making trouble for the physicist. To add fuel to the animosities between Volta and Galvani, the physician stubbornly refused to pledge allegiance to the French flag. Volta's situation became so bad at one point that Napoleon, himself, intervened to save the neck of his favorite scientist. When the political air finally cleared, Volta returned to the scientific tasks at hand. The only remaining problem was finding a way to get a more convincing amount of electrical tension from his contact metals. He came upon the idea of piling copper and zinc discs on top of one another, sandwiching a piece of brine-soaked cardboard between each pair. 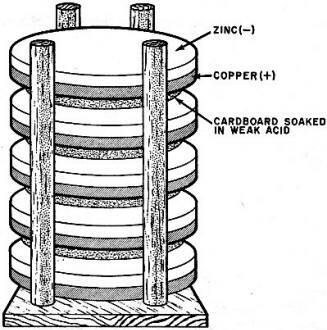 This "pile" of metals and cardboard actually formed what we now know as a series aiding circuit. In 1800, Volta described the final results of his work in a long, two-part letter to Joseph Banks, President of the Royal Society of London. Banks prepared the letter as a formal scientific paper for the Philosophical Transactions of the British Royal Society. Published under the title of "On the Electricity Excited by the Mere Contact of Conducting Substances of Different Kinds," the world learned of Volta's source of continuously flowing electrical energy. This famous paper clearly showed that a chemical action between pairs of brine- or acid-soaked metals produced the new form of electricity. Thus, Galvani's theory suffered a sudden and complete death. The first part of Volta's paper described the construction and effects produced by his electric pile: "... if the sets of triplets of the plates be added 20 or 30 more, disposed in the same order, the actions of the extended pile will be much stronger, and be felt through the arms up to the shoulders; and by continuing the touchings, the pains in the hands become insupportable." Volta also noted that the "perpetual" electrical action stopped as the cardboard pieces began to dry out. To remedy this problem Volta invented the "crown of glasses" - glasses filled with a weak acid solution and containing a pair of unlike metals. By attaching wires from an electrode of one kind to an electrode of the other kind in another glass, Volta wired up what we now know as a series cell arrangement. This makes up a more familiar version of wet-cell batteries that are employed today. Although Volta and Galvani were bitter enemies, Volta gave Galvani full credit for leading him into the kind of research that resulted in the "pile" and "crown of glasses." Largely due to Volta's support, his "perpetual" current became known as "galvanic current." Electrical researchers later named the galvanometer after the unfortunate Italian physician. Volta, however, could not resist taking one public jab at the man who had been his rival for so many years. When Napoleon invited Volta to demonstrate his inventions before the political and scientific leaders of the French Empire, Volta introduced his electric pile by unwrapping it from the skin of an electric eel - the animal that represented Galvani's strongest argument for "animal electricity."